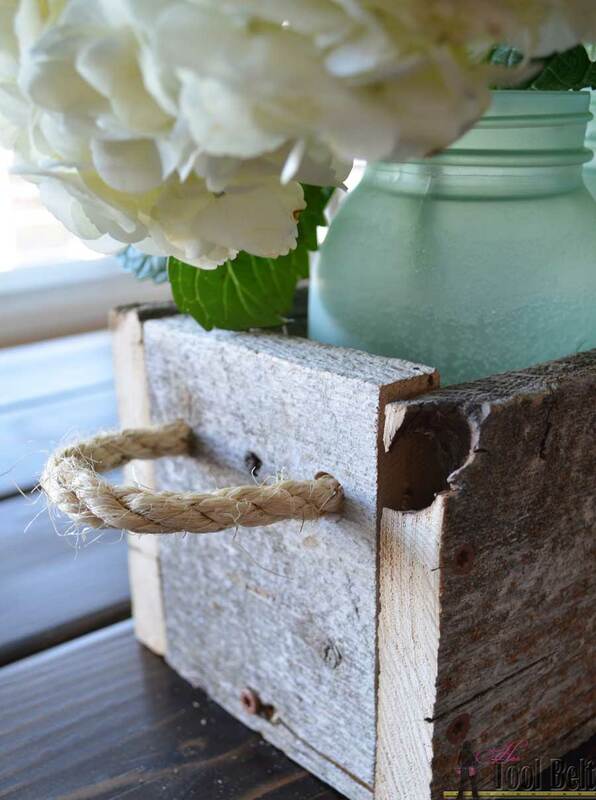 My friend has a big family party coming up and needed help with barn wood mason jar box centepieces. She needs a variety box centerpiece sizes: 3 jar, 4 jar and 5 jar. 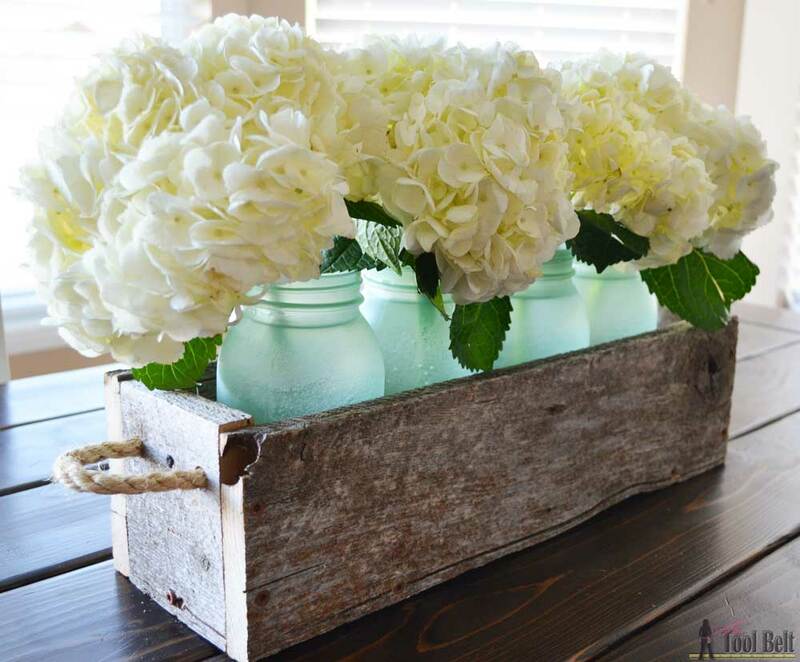 These trough style boxes are simple to make and they are so handy to have on hand for home decoration, holiday decor and parties. 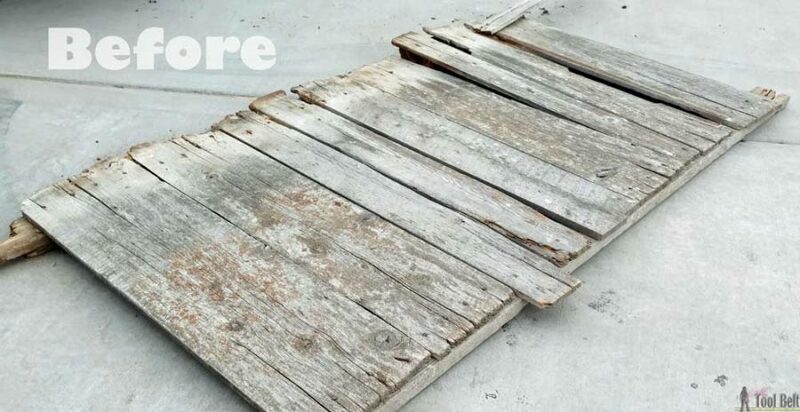 I was happy that my friend wanted the barn wood (reclaimed wood) look since I have a nice stash of barn wood laying around :-), which makes building these super super cheap. I started with this little fence panel and I was able to get 7 boxes out of it. I took apart the fence and made sure to remove all nails. The final product turned out pretty cute, I’m loving the sea glass colored mason jars and the rope handles. There are lots and lots of variations for box height and length. 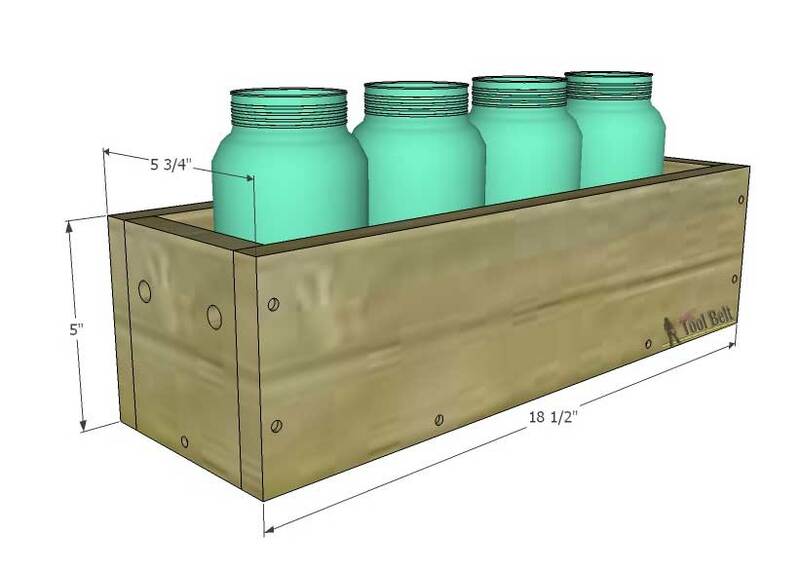 I’ll go through the simple instructions for a 4 quart jar box at 5″ tall. Then I’ll show variations that you can make. Cut the bottom and end pieces. Drill countersink holes (1-2) about 3/8″ up from the bottom of the end pieces. Use wood glue and 1 1/4″ screws (min) to attach the ends to the ends of the bottom piece. 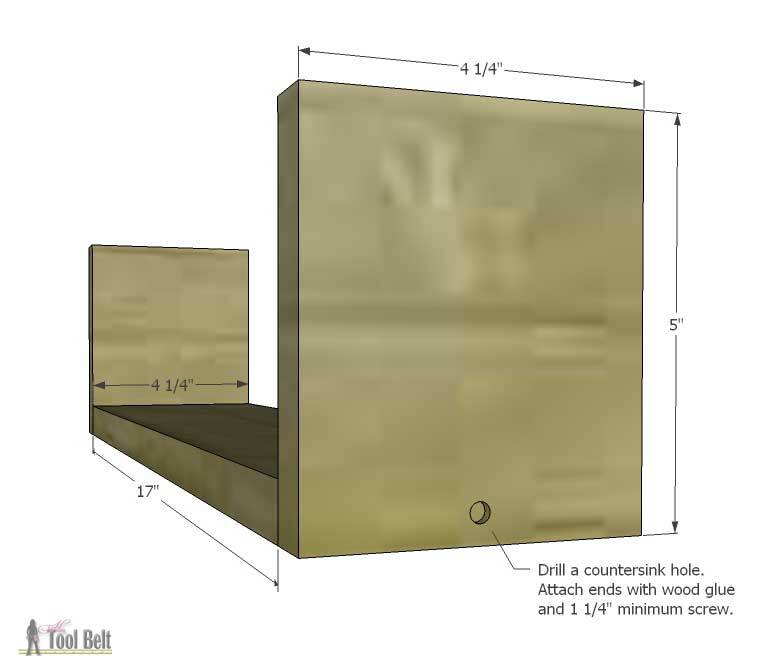 It’s a good idea to double check the measurement for the length of the sides, especially if you are using reclaimed wood because the thickness can vary. Cut the 2 long side pieces. Drill countersink holes, about 2 along the bottom and 2 on each end. 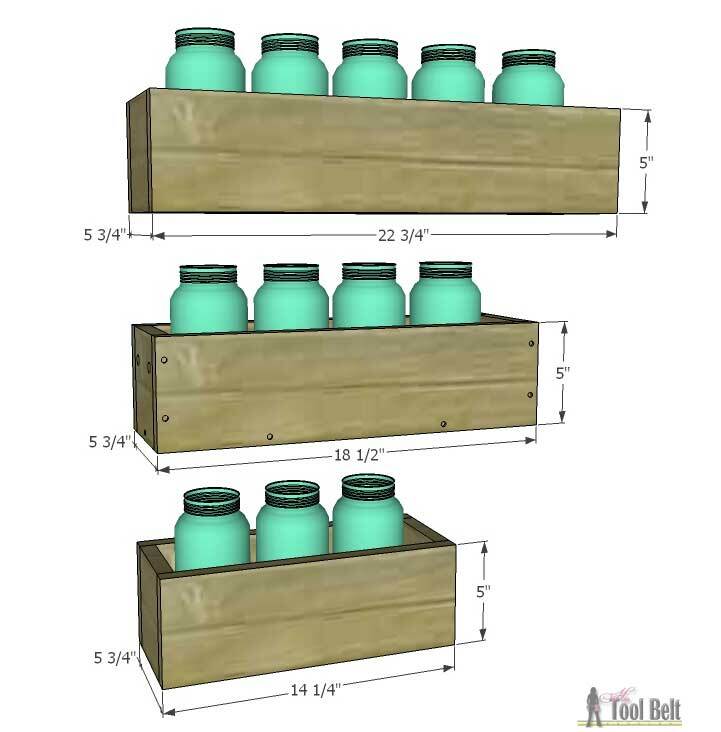 Use wood glue and 1 1/4″ screws (min) to attach the long sides to the bottom and ends. 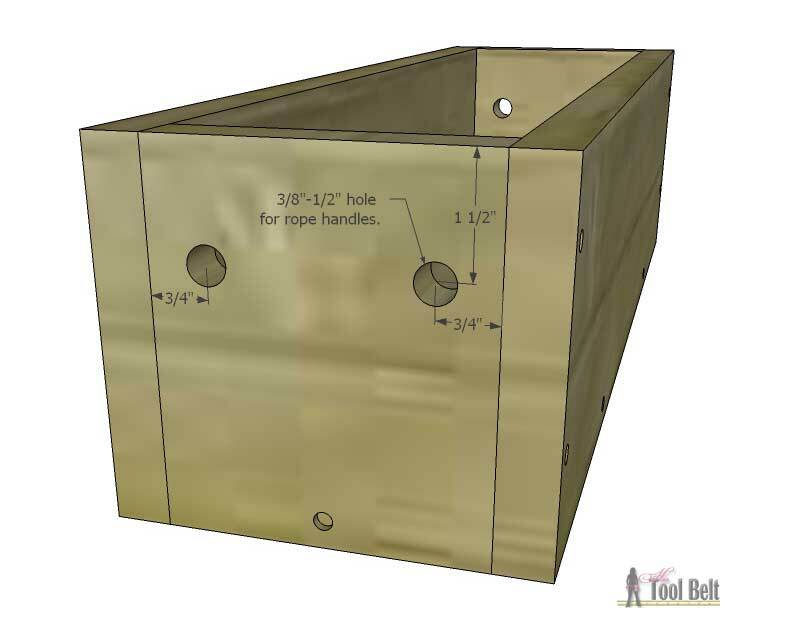 If you want to add rope handles, drill 3/8″ or 1/2″ holes for the rope. Thread the rope through and tie knots in each end. That’s it for the box, it’s a really easy project. If you want to make different lengths here’s a table of different cut lists. I usually keep the bottom piece about 4 1/4″ wide and give 4 1/4″ length for each jar that I’m planning on. Cut List Options for different sizes. 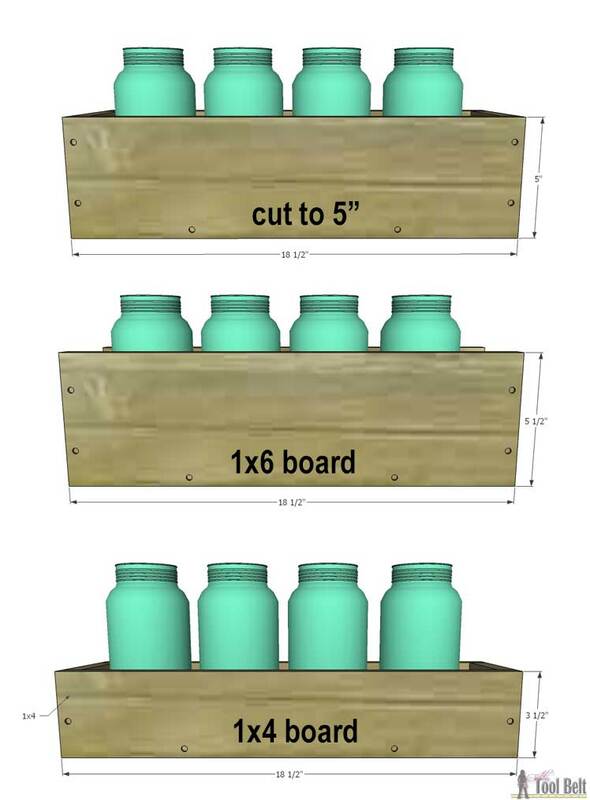 If you want to change the height of the box, here’s a little visual with quart sized mason jars. 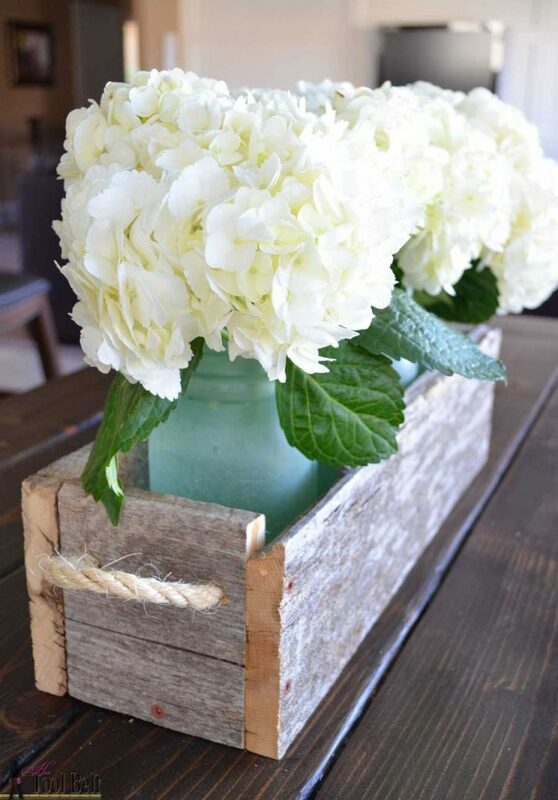 There are lots of options that you can do to make trough box centerpieces. For my mason jars, I loved Sadie Seasongood’s upcycled sea glass bottles so I thought I’d give it a try. 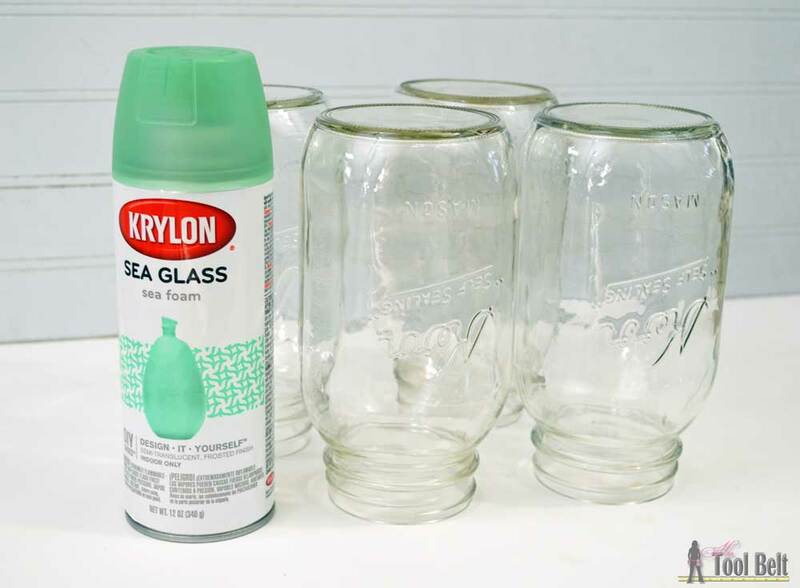 I bought some of the Krylon translucent sea foam spray paint to coat my jars. I applied a couple of thin coats, because I wanted them fairly translucent. I did one coat with the jars upside down, then let the paint fully dry. I turned the jars over and applied another coat. I think the jars turned out really pretty. I love that green color with the barn wood. My Costco carries these white hydrangeas that I love. They are 5 hydrangeas for $9.99. They are so boofy and pretty. Love these trough boxes! 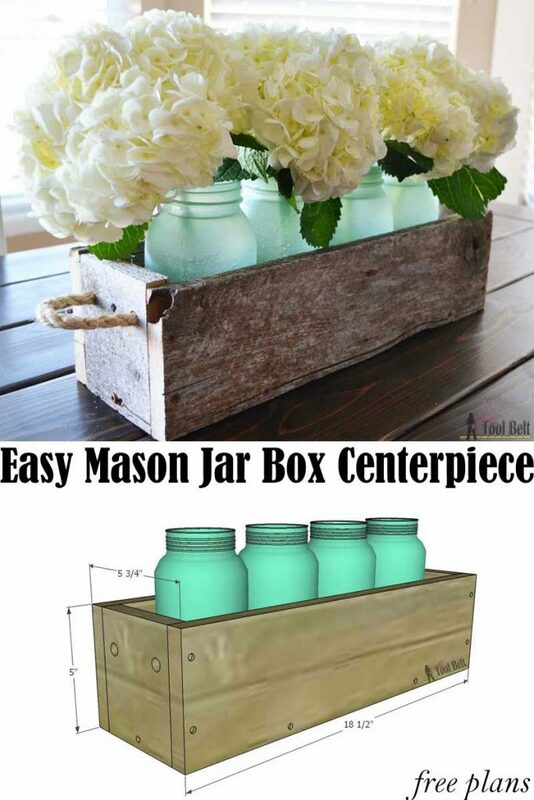 Smart to make them to fit the Mason jars…. I aways try to fit the jars in after I’ve made the boxes..uh, duh! Wish we could grow pretty hydrangeas like yours. Pinned this super project! These trough boxes are so pretty! Thanks for sharing. I am just drooling over that fence wood! Perfectly aged. 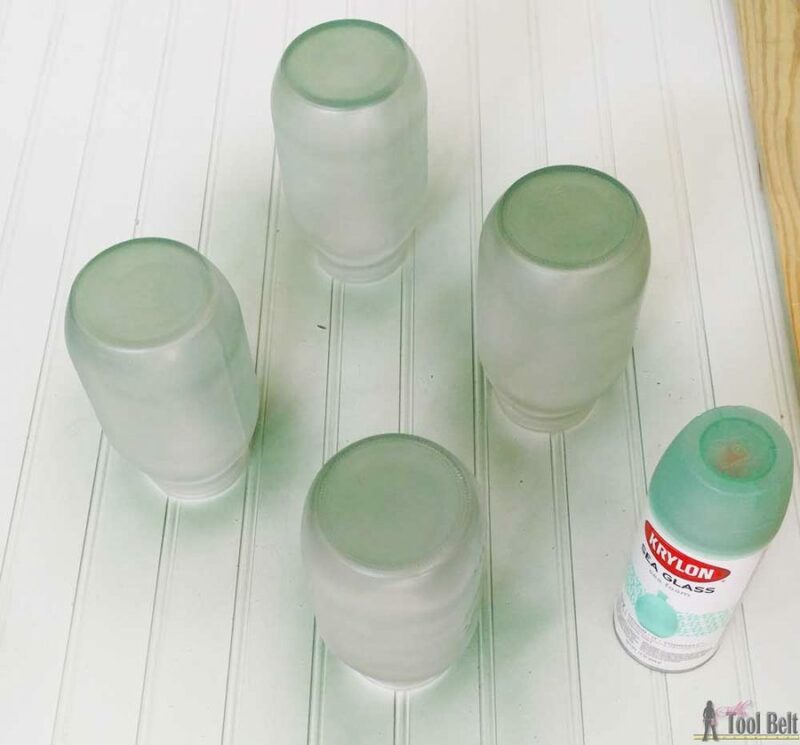 I’m inspired to check out the sea glass spray, your jars are so pretty. Well done Amy. You always make such beautiful pieces, but the patina of this one is spot on. So great. I hope you have a fantastic weekend. I’m visiting form Link Party Palooza. Love the way this looks! I really like the look or reclaimed wood also! I love this, it’s so perfect! And those mason jars are gorgeous! What a simply yet great idea!! I love it, thank you for sharing with us.